Okay, what else? Well, he can draw — or, at least, he owns a drawing, and he wrote his name at the bottom of it. Well, we don’t actually know that he wrote his name, we just know that his name is written there. It could have been written by someone else, either at his request or as a practical joke. When a guy is as mysterious as Claude North appears to seem to be, then pretty much anything is possible, except for writing a coherent blog post about him. So here we are, in the home stretch of the Parallel Time storyline, and the writers have decided to construct a mystery which they may not be entirely invested in. They’ve been throwing random clues at us for a week now — polar bears and hatches and smoke monsters and so on — and it’s difficult to fit those clues together, or even to understand why they’re spending time on this. 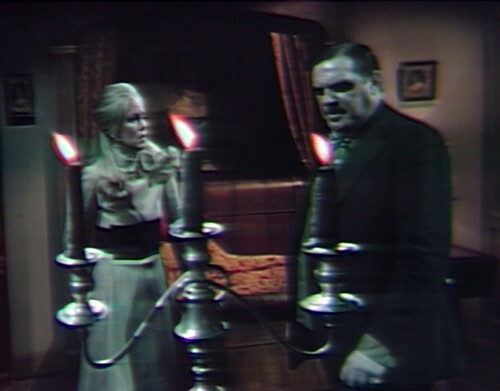 Now, I think I’m pretty good at this game of figuring out why the Dark Shadows writers make decisions, but in this case, with Roxanne and Claude North, it’s hard to understand what they thought was promising about this. So let’s claw north for a while, and see if we can figure out what they’re getting at. It all started with Parallel Angelique, who died in a hatpin accident six months before this mirror-universe story began. She’s been resurrected, somehow, and walks the earth sucking the heat out of unlucky dudes who happen to be passing by. For a while, we didn’t know how she managed the comeback, but two weeks ago, her father revealed that he was keeping a lady named Roxanne on a table in his back parlor, who’s donating her life force to Angelique through the medium of black candles and plot contrivance. 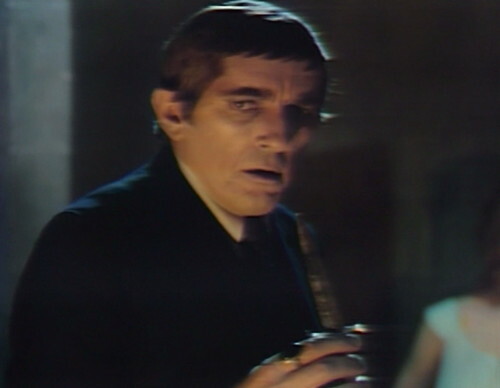 Barnabas can put a stop to Angelique’s murder spree by killing the girl, but on catching sight of her face, he’s found himself inexplicably drawn to her, which is usually the cue that he’s about to slow down the story and recite passionate monologues, usually in thinks. Who is she? Why am I inexplicably drawn to her? Does she realize I’m on the cover of 16 magazine two months out of three? You know the kind of thing. So he’s dedicated himself to the idea of romantically salvaging the girl, and if that means Angelique still roams the earth and pushes people out of windows, then that’s a risk that other people will have to take. It’s not his fault that rooms have windows. Barnabas Collins is not in charge of architecture. And that’s what brings us to the secret room in the Collins tomb, a classified storage facility that Joshua Collins constructed back in the parallel 18th century to keep guns and relatives in. Since Parallel Barnabas wasn’t a vampire, the shed has been vacant for centuries, so Regular Barnabas figures he can fill it up with unconscious girls that he’s drawn to. But when Barnabas and Will crack open the hatch, they find that someone’s been living down there, probably pressing a button every 108 minutes. The room has a thin layer of props, as follows: one cot complete with sheets, blankets and a pillow, one end table, one chair, one medium-sized candleabrum holding five red candles, one plate, one cup, one unrefrigerated bottle of fresh milk, one packing crate used as bedside table, and one charcoal sketch of Roxanne, with the name “CLAUDE NORTH” written at the bottom. Will doesn’t recognize the name, so Barnabas starts postulating, and the way this game works is that anything that the main character says is instantly true. When the writers want to establish a piece of story information, they have Barnabas say it, and then we can move on. That’s how we straighten out the ambiguity about the name on the bottom of the sketch. The occupant of the room didn’t go out and get a Claude North sketch to brighten up his dank apartment; the artist is the one who’s living here. Even if Barnabas hadn’t said that, it would probably be true anyway, because why bother throwing a name at us that isn’t important? So Claude found out about this secret room somehow, probably through AirBnB, and he’s been living here because he’s either too cheap to stay at the Collinsport Inn, or he’s afraid that someone will recognize him. He’s been in the area for a little while — you don’t get candles and a cot all of a sudden — and he’s spent time drawing a missing persons poster. That leaves us with two questions: Who is he hiding from, and how did he arrange for the milk delivery? Okay, fast-forward a couple days. 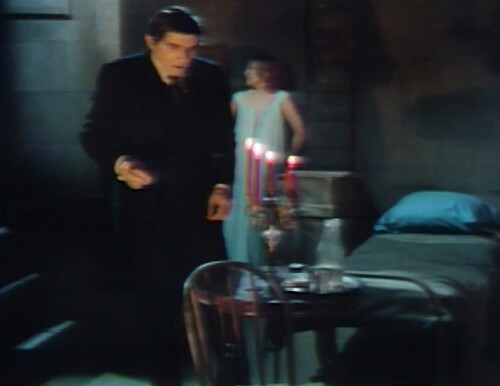 Barnabas manages to persuade Roxanne to get up off the table using electricity and the power of inexplicable romantic magnetism, but she can’t speak, or even take much of an interest in the world around her. 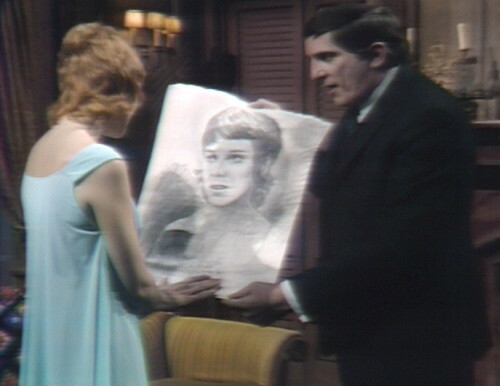 Trying to break through the static, Barnabas shows her the picture that he apparently stole from the mausoleum before he left, which was a bold move. Claude only owns, like, seventeen things, twelve if you don’t count the candles. I think he’s going to notice if his sketch is gone. He’s probably looking all over for it, which in his case means fifteen square meters of floor space, so it’s not going to take him long. But this is the one thing that makes Roxanne perk up. She smiles, and reaches out a hand to touch Claude’s signature. “You’re capable of reacting to something!” Barnabas notes, which tells you everything you need to know about this relationship. “You recognize the name!” he observes. “Claude North is important to you! Why? Can you tell me who he is?” She can’t. She can smile, and she can rub up on the signature, and that is the extent of it. But who needs evidence, when you have postulates? It’s amazing how they can cut through the clutter just by having Barnabas assert things. For example: he takes Roxanne on a field trip to the cemetery, which must have involved one hell of a bus ride. Leading her inside the spookiest building in the spookiest place she’s ever seen, he notices that she’s apprehensive. “You have been here before, haven’t you!” he concludes. “You know where you’re going, and there’s something about it that frightens you.” The distinction between Roxanne knowing where she’s going and not knowing where she’s going is apparently something that only Barnabas is able to deduce. On this visit, there are some minor changes in the set dressing. Cot, chair, cup, candles and packing crate are the same, and that bottle has just as much fresh milk in it as it did last time. But there’s two new additions — a box of matches on the table, which wasn’t there before, and a dagger. So what can we make of that? Claude must have noticed that the sketch is gone, so he knows that somebody’s been pilfering from his secret hideout. In that circumstance, I’d probably clear out, and take my little cot to some other dank enclosure, before the intruder comes back with the parallel caretaker to shout You must not disturb the dead! at me. There is something evil in the air! he would say, in a parallel fashion. Do not disturb them! They must rest! But Claude doesn’t appear to be bothered by the break-in. Not only does he leave all his stuff there, he also drops off the dagger, apparently to see if he can generate more buzz with new inventory. Barnabas shows the dagger to the girl, which is questionable first-date behavior, and she’s unnervingly thrilled to see it. She smiles, and strokes at it, and smiles some more, and she’s going to keep on smiling and stroking for as long as he puts it in front of her. “Ah, you know who it belongs to!” Barnabas postulates. “Then you know who’s been here! Is it the man named Claude North?” She doesn’t answer. “I’ve got to find a way to make you speak to me!” he continues. So the fascinating thing here is that Roxanne responds to the name “Claude North” when it’s written down, but not when she hears it out loud. There are two possible explanations for this: a) Roxanne is deaf, or b) we’ve been pronouncing “Claude North” wrong this whole time. Stokes: There is one way to find the body, without even going to look for it. Angelique: How can you find it? Stokes: By contacting Claude North, wherever he is. Angelique: Claude North? Who is he? Stokes: A man you’re better off not to know! I promised myself I’d have nothing further to do with him. Angelique: Well, you’re going to break that promise, father! You’re going to get in touch with Claude North tonight! 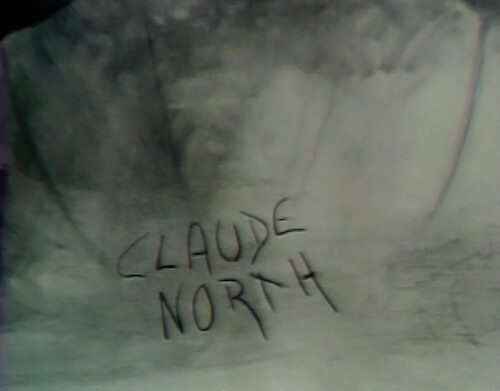 Now, the great thing about the name “Claude North” is that it feels like something you’d get used to eventually, but you never do. It doesn’t matter how often people say it. The sentence “You’re going to get in touch with Claude North tonight!” is always going to sound like that. Also, if Stokes doesn’t know where Claude North is, then how is he going to get in touch with him? Angelique: Father, you’re wasting valuable time just sitting there! Stokes: Listen to me, Angelique. I’ll try to find Roxanne on my own once more. If I fail, then I’ll contact Claude North. Angelique: Why are you so afraid of Claude North? Angelique: It is that you’re afraid! And what is his relationship with this Roxanne? You still haven’t told me that! Stokes: And I don’t intend to! I’ve told you it would be better off to have nothing to do with Claude North! Angelique: All right, you do it your way one more time, but if you don’t succeed, you’re going to go and find him! I’ve come too far to have everything destroyed by your fear for some ordinary man! Stokes: Claude North is not an ordinary man, my dear! You’ll know that at once, if you meet him. And then he goes right downstairs and gets on the phone with guess who. 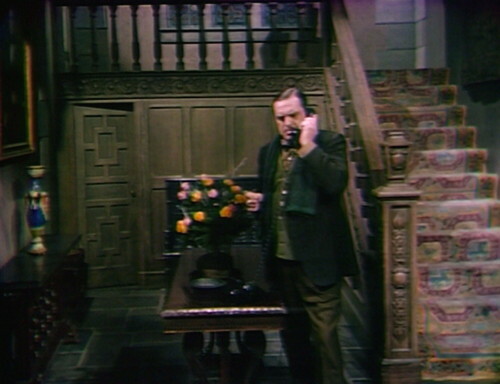 “Are you sure, Mr. North, you’re not playing a prank of some kind?” says Stokes, standing in the middle of the Collinwood foyer and oh my god he is actually talking on the phone to the actual Claude North. “Are you sure Roxanne isn’t with you?” asks Stokes. Claude is sure. Claude North is not an ordinary man, but he’s ordinary enough to be able to tell when he’s in the same room as Roxanne. She’s very quiet, but still you could just swivel around, and either she’s standing there looking vacant or she isn’t. “Of course I’m serious!” Stokes continues. “She’s disappeared, and it’s imperative that she come back at once. Perhaps you could use some of that rather special psychic sympathy that seems to exist between the two of you to find out where she might be.” So that’s another thing that we know about Claude North, he has psychic sympathy with people. Of course, the real question here is: how did Stokes reach him on the telephone? The two things that we know about Claude North’s living situation are a) he’s staying in the secret room in the mausoleum, which doesn’t have phone service, and b) he’s never there anyway. Okay, you want something else that’s perplexing? Stokes wraps up the conversation by asking Claude to meet him in half an hour “at the usual place.” Then he heads for the Collins mausoleum, and watches from behind a tree as Barnabas enters the building and opens up the secret room. “He knows that too?” Stokes wonders. “He knows too much — far too much! He must have the girl!” which he doesn’t, but it’s a good guess. So what I infer from that particular postcard from the infinite is that the secret room in the mausoleum is “the usual place,” but if it is, then why isn’t Claude there? 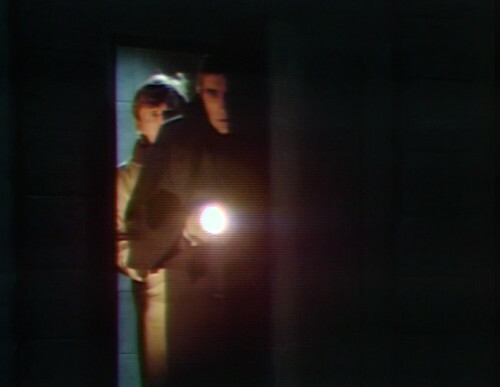 Still clawing north as hard as he can, Barnabas makes his third visit to the secret room, and finds another props adjustment. “Someone’s been here!” he realizes. “It’s been cleaned up!” This means that the milk is gone. But there’s always something new over at Claude’s place. Sitting on the cot and waiting for its closeup, there’s a ring inscribed with the initials C.N. 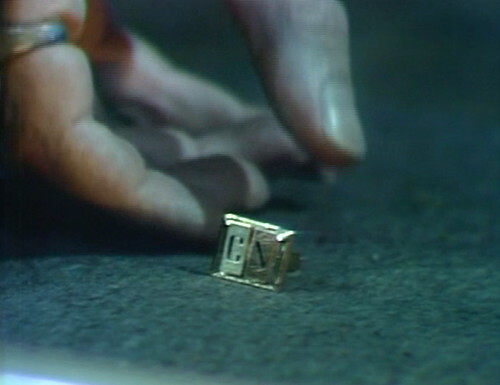 Barnabas examines the ring, and takes a moment to assess the implications. “C.N.,” he muses. “Claude North! Of course!” That’s why Barnabas gets the big bucks; he’s a deducer. So that’s one more thing that we know about this mystery man: he owns a lot of objects that have his name on them. The man knows how to build a brand. Okay, there’s one more incident to cover, and then we can put this to bed. 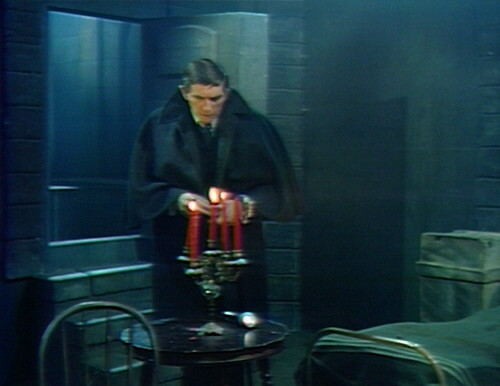 Barnabas goes back to the Old House to have some conversations, and then he heads back to the mausoleum again for his fourth visit to Claude’s pad. I don’t know if it’s psychic sympathy or what, but Claude has incredible customer retention. People can’t stay away; they’re going to have to keep the mausoleum open 24 hours a day. While he’s sitting in the secret room, Barnabas hears someone enter the mausoleum, and he emerges, and guess what, it’s Roxanne. She flits away, as mysterious fairy princesses so often do, and then he finds her staring at a gravestone, and you’ll never believe what it says. There it is, plain as day: CLAUDE NORTH — 1814-1866. So that explains everything, except the milk. Obviously, none of this connects to anything. The sketch, the ring, the grave, the phone, the dagger, the psychic sympathy and the knowing too much; there’s not a single clue that illuminates any of the other clues. They could pile up a hundred more suggestions like this — a horseshoe, a library card, the smell of wet leather, a vibrating dwarf who says Htron Edualc — and we still wouldn’t be any closer to solving the mystery, or even identifying what mystery we’re supposed to be solving in the first place. 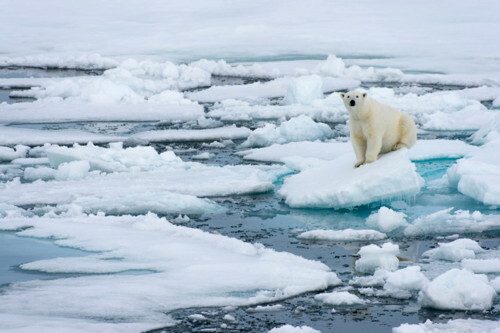 We could claw north until we reach the North Pole, and still not understand what they’re getting at, because it turns out they’re not getting at anything in particular. So let’s try to get into their head space for a minute. Obviously, there wasn’t a plan, there’s never a plan; we don’t have to worry about that. We just have to think about this from the writers’ point of view. They’re getting to the end of Parallel Time, and they need a way to destroy Angelique. But they don’t know what they’re going to do after Parallel Time, so they need to stretch out the story a bit. They also, apparently, need Barnabas to have a love interest. He always has one, and they’re always inappropriate, but they appear to be mandatory. They’ve tried to use Parallel Maggie for this purpose, but given the single-minded focus of the storyline on getting Maggie back together with her horrible husband, they realized that wasn’t going anywhere. So if there’s a method to destroy Angelique that’s also a pretty girl that Barnabas could feel drawn to, and slows things down to a crawl, that would be great. Also she has to be some kind of supernatural, but if we could think of a new monster then we wouldn’t be in this mess to begin with, so let’s just make her mute and remote, and that’ll create an air of mystery without actually locking us down to anything. Okay. We’ll create a pretty girl named Roxanne who Barnabas is attracted to, and she’s connected to Angelique. But who is she? We don’t have time to give her a real backstory, but maybe we could make it a mystery — a hint here, a clue there — and then either it adds up to something, or it doesn’t. Either way, we’ll head back to our home dimension, and forget all about it. So let’s say there’s a boyfriend — or not a boyfriend, but a mystery man — and he’s got control over her, or possibly she’s got control over him. It doesn’t matter. She’s looking for him, or he’s looking for her, or both. Really, all we need is to create the impression that there’s a mystery here, just until we’re ready to move on to the next story. The clues don’t need to add up; each one just needs to sound enough like a clue to get us to the next commercial break. We need enough words on the page to make 22 minutes of television. Don’t think about what you’re doing. You don’t have time to feel bad about yourself. Just put words on paper. And that is how they came up with Claude North. This is a thing that happens to writers, when you’re distracted and tired and you’re on a tight deadline that you absolutely cannot meet, but you have to meet it anyway because they need to tell the set designers what sets they’re going to need next week. You go through The Writer’s Five Stages of Grief. The first four stages are “I am a terrible failure,” and the fifth stage is that you write words and hit send. That’s how writers live. So Claude North can’t be understood as a coherent phenomenon, because he isn’t one. He’s not a character; he’s a coping strategy. He is what happens when writer’s block meets deadline. Sometimes you just have to sit down and write words, and sometimes, alas, those words are going to be Claude, and North. 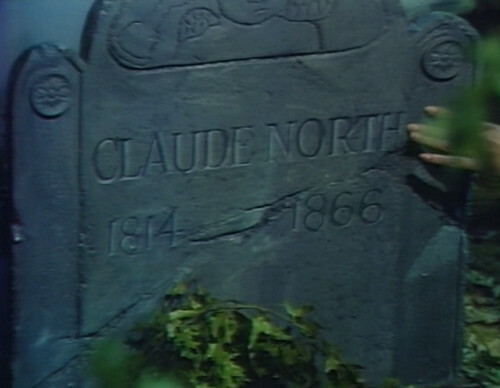 Barnabas tells Julia that he saw the grave of a man named Claude North, but he can’t be the same person who drew the sketch of Roxanne: “The one who died in the graveyard died in 1866!” He doesn’t actually mean that the guy died in the graveyard. Claude North is an inoffensive Noah Gifford. He’s obvious padding, but at least he’s not as badly performed. Still forgettable. “[Claude North] is not a character; he’s a coping strategy.” This will help me get through my next run of PT. How did Stokes call Claude North? On the Psychic Hotline! Why milk? Was there some milk drinking psychic sympathizer character in literature that we’re not remembering? And it might not even be milk at all! If we take into consideration the 100 proof habits of most of the DS characters, Clawed was probably hanging around the mausoleum, drinkin’ white Russians – til the vodka ran out. That’s why he’s gone; he’s on a booze run. Which is why Stokes found him so easily, he just phoned the local liquor store. It’s too bad they didn’t have a better vision for this, because I found the actor, Brian Sturdivant, a little intriguing. He had the looks of someone who fits well into a Gothic kind of show. It was hard to tell from the role if he was much of an actor or not. Brian Sturdivant is an actor, known for Von Richthofen and Brown (1971), Dark Shadows (1966) and The Coming Asunder of Jimmy Bright (1971). I found him intriguing as well, but I’ve always liked that dark, brooding type. However, I would want him to lighten up a little every now and then! IMDB lists, as a co-star on Jimmy Bright, a certain Addison Powell. No wonder Jimmy came asunder! Stokes: Listen to me, Angelique. I’ll try to find Roxanne on my own once more. If I fail, then I’ll contact Jimmy Bright. Angelique: Why are you so afraid of Jimmy Bright? Stokes: And I don’t intend to! I’ve told you it would be better off to have nothing to do with Jimmy Bright! Stokes: Jimmy Bright is not an ordinary man, my dear! You’ll know that at once, if you meet him. Oh, now I want to see the Jimmy Bright version. He should enter the scene wearing a spangly jacket, and throwing confetti like Rip Taylor. You just made me spew some liquid. Gentle readers: Do not consume beverages while reading this blog! Do not consume liquids with DSED. May cause convulsions. Uncontrollable laughter has bee reported; in some cases, involuntary urination may occur. Ask your doctor if DSED is right for you. Although, wouldn’t it be really convenient if he did die in the cemetery? “His own actions and emotions” would be somewhere on the list, I’m sure. The show, probably starting with the Adam storyline and certainly the Quentin, had become like Dr. Who. 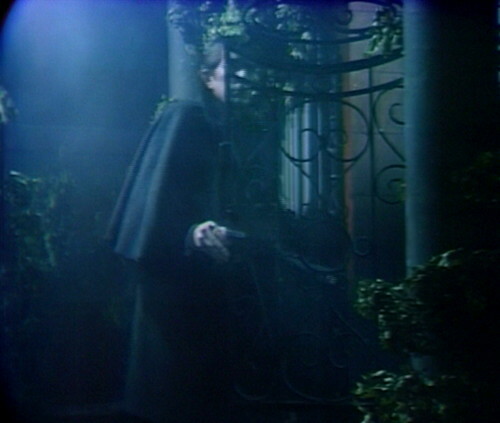 Barnabas was the Doctor, and Julia was the companion, fighting different villains. The probkem was when the time trip ended, all the story threads were wrapped up and the writers had to get something new going in a hurry. PT is ending and there are no compelling storylines waiting in regular time. I’m sure every time a story wrapped, the show hemorraged viewers who figured everything is wrapped up, I don’t need to come back. If only Barnabas had put Inspector Hamilton on the case – I bet he could have found all the answers about this so-called Claude North (if he can so be called). Judging by how well he’s doing with the Angelique Collins case…and the William Loomis case…and the Bruno Hess case…and the Dameon Edwards case…and the Cyrus Longworth case…and the Sabrina Stuart case…hmm, guess he doesn’t need any more on his plate, just now. I figured out the milk, by the way, but I can’t find a place for it in the post so I’m just going to put it here. When Barnabas and Will first visit Claude’s mausoleum hideaway, they needed to signal that someone is actually currently living there — otherwise, it could just as easily be someone who was there a decade ago. They needed something to indicate “we just missed him,” so: a bottle of milk, which Will says is fresh. It’s dramatic problem-solving in a super mechanical way; the fact that it doesn’t make sense is immaterial. And by the way, is the milk bottle half empty or half full? We could at least tell whether Claude is a pessimist or an optimist. Parallel Time ultimately fails because the stakes are not personal to Barnabas. 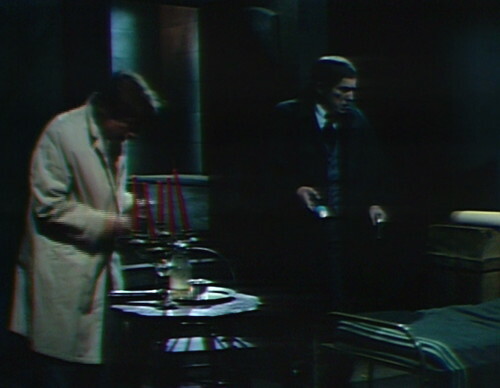 Once DARK SHADOWS transitioned into a show about Barnabas, every successful storyline was personal to him. 1795 is perhaps the best example of this (and is arguably the strongest storyline as a result). Even when the Dream Curse and Adam/Eve went off the rails, the narrative remained focused on Barnabas. 1897 came the closest to success with a non-Barnabas-focused plot line. It eventually became primarily about Quentin Collins. For whatever reason, that same magic — Quentin’s relationships with the 1897 Collins family — couldn’t be duplicated afterward. 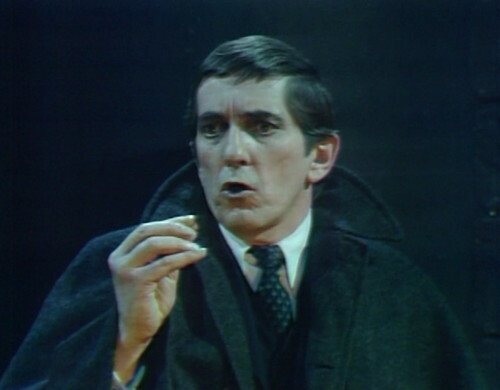 I know it’s crazy of me to kibbitz over an almost 50-year-old plotline but I think PT 1970s stumbles right out of the gate from the decision to root its reality in that universe’s Barnabas Collins basically having a “happily ever after” rather than a “worse than we thought possible.” Instead of marrying Josette, what if PT Barnabas had remained in that bad marriage to Angelique — sure he never became a vampire, because he was never bold enough to stand up to her. He surrendered himself to her and the present-day Angelique, as evil as her ancestor, is the result. That would have been personal to Barnabas, who in this storyline hates Angelique because she looks like his Angelique and is mean to a woman who looks like a woman he likes. For that matter, they’re occasionally meaningless in our universe, too. When I was doing my doctoral research back in the early 1980s, I found the grave of the man whom I was researching, which listed his year of death as several years after he actually died. I had absolute, incontrovertible proof (family letters, newspaper obituaries, etc.) that his death had occurred in 1866 (a remarkable coincidence, I know), yet his tombstone said 1872 (or perhaps 1871 — I forget after so many years). (And, yes, it was definitely his grave, buried as he was alongside several members of his family.) I believe the error was caused by the fact that his grave had been moved from its original 1866 plot to a new location several years later, but how and why it wound up with the wrong year, and why his family didn’t bother to correct it, is beyond me. And PT Quentin could be the descendant of PT Jeremiah and PT .Josette. I can’t imagine a stronger motive for Barnabas than to keep the descendant of a josette out of the clutches of the descendant of an angelique. In PT, didn’t Barnabas marry Josette back in 1795 (Angelique never surfaced at tha time, and Barnabas didn’t become a vampire), and Bramwell was their son? Yes, but that wasn’t written until later. IIR, Will’s book said that Barnabas married Josette in 1795 and died in her arms. I don’t think their children were named, so Bramwell was a later invention. Or possibly 1840 PT was a different PT than what led to 1970 PT. It’s not like they were still holding family lotteries to see who went crazy in the turret room in 1970 PT. PT Quentin could also be a direct descendant of PT 1897 Quentin. That was my assumption. I was just brainstorming on Stephen’s alternate concept above. But he arrives too late, and materializes in 1866 just in time to see Claude North’s old Civil War buddies pouring half-glasses of milk over his freshly-covered grave. Looking back I’m wondering if Claude North had any psychic abilities at all.